Passengers traveling to the airport that no-show a reservation will be required to purchase a new ticket in order to travel. Passengers from the airport that miss their scheduled departure due to a late flight, will be allowed to use their ticket on the next available coach without penalty. Michigan Flyer-AirRide passengers who are planning to travel to or from Detroit Metro Airport (DTW) now have the ability to change their own motorcoach reservations online. This new web-based functionality is available only on the day of travel. Reservations can be changed to another time on the day of travel or to the next day. Other reservation changes can be arranged, as usual, by calling the Michigan Flyer office at 517-333-0400 during regular business hours. Changes to reservations online should be done before the scheduled departure time of the existing reservation. On the day you wish to make a reservation change, login to your account by clicking the “Returning Customers” link in the “Book a Trip” box. Click “View previous orders” in the Welcome box on the left, and then select your reservation for the current day. On the next screen showing your current travel schedule, click “Reschedule Travel” at the top, then choose a new date and time from those listed. To finish, click the “Update Passengers” button. The new reservation will be confirmed in red type at the top of your current travel schedule. Also, the ability to change reservations online is only available to passengers traveling to or from DTW. It is not applicable to those traveling just between East Lansing and Ann Arbor. Non-airport Passengers: Same-day changes in departure times are permitted if seats are available, so long as passengers call to change the reservation before the reserved departure time. Passengers traveling between East Lansing and Ann Arbor who do not show for their scheduled departure must purchase a new ticket. Do I have to buy my ticket in advance? Discounted fares require pre-payment via credit card on our website. You can pay cash to the driver for a ticket, but the fare is higher, exact change is required, seating is based on availability, and only single passenger tickets are available at the coach. Must I print my confirmation and bring it with me? Paper boarding passes are no longer needed. Our drivers use handheld devices called "phablets" (combination smartphone and tablet computer) to check in passengers electronically. Still, to avoid any potential confusion, please jot down your reservation number and be prepared to give it to the driver. 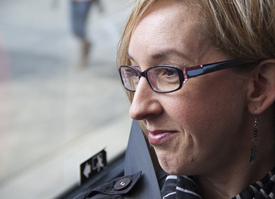 If I miss my scheduled coach, can I take another one without having to pay again? It depends. If you miss your scheduled coach due to a flight delay at the airport, then Yes, you are welcome to take the next available coach at no additional cost. However, passengers traveling to the airport or non-airport passengers traveling between East Lansing and Ann Arbor who do not show for their scheduled departure must purchase a new ticket. Do you have signs at Detroit Metro Airport? No. But our motorcoaches are clearly co-branded as Michigan Flyer-AirRide. In McNamara Terminal follow "Municipal Transportation" and "Ticketing/Check-In" signs to Departures (Level 3), and look for us outside and to the left of the doors for Air France check in. At the North Terminal, follow "Municipal Transportation" signs to Ground Transportation and find a small "AirRide route 787" sign by stall number 1. Does the motorcoach have seat belts? Yes, our coaches are all equipped with 3-point seat belts for added safety. Are child car seats allowed on the coach? While child safety seats are not required on motorcoaches, you are welcome to bring a car seat if you own one. Are pets allowed on the coach? No. As of Sept. 1, 2018, we no longer transport pets. However, we do welcome service animals on board with customers who have disabilities. Service animals may ride in the passenger compartment of the bus at no additional charge. As defined by the Americans with Disabilities Act (ADA) “service animal” means any dog that is individually trained to do work or perform tasks for the benefit of an individual with a disability, including a physical, sensory, psychiatric, intellectual, or other mental disability. In addition, miniature horses that have been trained to help people with disabilities with specific tasks may now be considered service animals. (For more information about service animals, please see our policy on People with Disabilities). For transportation purposes, “emotional support animals,” “psychiatric support animals,” or any dogs, cats, birds, or other animals that are not trained to perform a specific function for a person with a disability are all classified as pets under federal ADA law. Changes and Cancellations- If you have created an account changes can be made for passengers flying in and out of Detroit for same day or next day changes. Changes need to be done before the scheduled departure time of the existing reservation. Log into your account and make the schedule change. If you don't have an account, your travel is for tomorrow or after, or if you are traveling between East Lansing and Ann Arbor, please call our office during office hours to make the changes.. 517-333-0400. Children 12-17 traveling without a parent- Please see "Unaccompanied Children" on our FAQs & Policies page. Ann Arbor 'AirRide' senior rates- Senior rates out of Ann Arbor require a senior GoldRide card issued by the Ann Arbor Area Transportation Authority. If you have a senior GoldRide card and want to book a reservation online, click here. What if I can’t find my answer here? Call us at 517-333-0400. As of Sept. 1, 2018, we no longer transport pets. However, we do welcome service animals on board with customers who have disabilities. 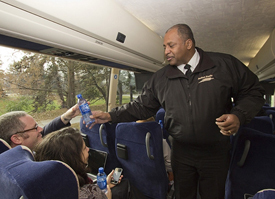 Service animals may ride in the passenger compartment of the bus at no additional charge. For more information, please see our FAQs and the section on People with Disabilities. 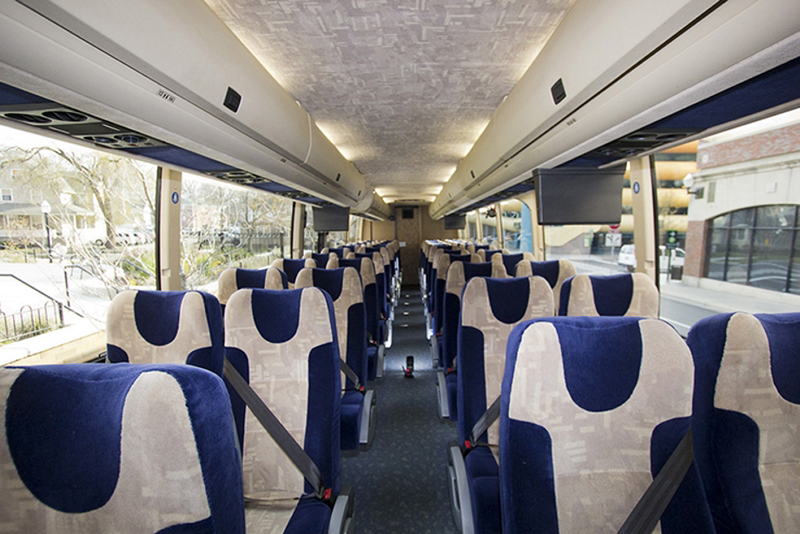 Our fleet is made up of state-of-the-art 2012 Prevost H3-45 motorcoaches with engine technology that exceeds EPA standards, produces near zero air pollution emissions, and achieves high fuel economy. Free WiFi - when available. Lack of signal may prevent this offer and no refund will be provided due to lack of onboard Wifi. Free Water. When available free bottled water will be on board. Cancellation Policy for One-Way Tickets: Cancellations of discounted, restricted tickets incur no fees and fares are refundable provided that you notify the office at least 48 hours prior to the trip departure time. Please note, discounted, restricted tickets purchased within 48 hours of departure are non-refundable upon purchase. Cancellation Policy for Round Trip Tickets: Cancellations incur no fees and fares are refundable provided that you notify the office at least 48 hours prior to the beginning of the entire trip. Once your trip has begun, the return portion is completely non-refundable. Please note, tickets purchased within 48 hours of departure are non-refundable upon purchase. No Shows: Passengers who "no show" a prepaid reservation are not entitled to a credit or refund. Cancellations can be made by calling the Michigan Flyer office at 517-333-0400. If you just got off Michigan Flyer-AirRide and believe you left something on board, call our office at (517)-333-0400. We will attempt to contact your driver and find your missing articles. Or, if more than a day has passed since your ride on Michigan Flyer-AirRide, call us and we will check our Lost & Found area to see if your missing item was turned in. Overweight and oversize baggage is accepted on a standby basis. Bags that do not meet our size and weight restrictions require special handling, for which there is an additional fee of $15 per bag. A bicycle counts as one oversize, checked bag. Michigan Flyer-AirRide motorcoaches are wheelchair accessible. However, 24-hour advance reservations are recommended. Please call our office, or fill out the ADA form when making reservations online. Please notify our office if you will be traveling with a scooter or service animal. Passengers who need help in getting from our bus to the terminal, or vice versa, must let us know in advance. You can do this when making reservations online. Just use the Special Needs box on the Passenger Information webpage to tell us what kind of help you will need. Passengers who need wheelchair assistance should normally request it when making reservations their airlines, which contract with Prospect Airport Services to provide wheelchair services. However, if you did not arrange for assistance from Prospect through your airline, you may do so by calling Prospect from your bus before it arrives at the airport. Prospect’s phone number at the McNamara Terminal is (734) 921-7200; at the North Terminal, it’s (734) 247-1121. For example, a good time to notify Prospect that you’re on your way and will need assistance is when your eastbound bus reaches Ypsilanti or Bellville. If you will need wheelchair assistance to reach our bus after a return flight to North Terminal, consider asking for an aide from Prospect to meet you in the indoor waiting area about 10 minutes before your westbound motorcoach is scheduled to depart. Please note that Prospect provides assistance with passenger luggage at McNamara Terminal, but not at North Terminal. We welcome service animals on board with customers who have disabilities. Service animals may ride in the passenger compartment of the bus at no additional charge. As defined by the Americans with Disabilities Act (ADA) “service animal” means any dog that is individually trained to do work or perform tasks for the benefit of an individual with a disability, including a physical, sensory, psychiatric, intellectual, or other mental disability. In addition, miniature horses that have been trained to help people with disabilities with specific tasks may now be considered service animals. Examples of the services that true service animals are trained to provide include guiding people who are blind, alerting people who are deaf, pulling a wheelchair, fetching dropped items, alerting and protecting a person who is having a seizure, reminding a person with mental illness to take prescribed medications, or calming a person with Post Traumatic Stress Disorder (PTSD) during an anxiety attack. We don’t ask about a person’s disability, require medical documentation, or ask to see a special identification card or certificate of animal training. Credible verbal assurances are enough for us. Once on board, passengers must remain in control of their service animals at all times—on a leash or harness, or in a carrier—and the animal must ride within the passenger’s own space; it cannot occupy a separate seat or lay down in the aisle. So that all passengers may enjoy a pleasant ride, we ask you to keep your service animal calm and quiet. If we believe a service animal may threaten the health or safety of other passengers or our staff, or disrupt our operations (such as by barking, growling, biting, jumping on passengers, urinating or defecating), we may refuse to allow it on board. 1. Fares quoted are valid on Michigan Flyer/Airride schedule and/or those of participating interline carriers listed on the ticket. Fares are payable in U.S. dollars unless noted otherwise. 2. All tickets are date and schedule specific and will be honored for transportation unless otherwise indicated. 3. Walk-up passengers (those without a prepaid reservation) will be accommodated on a first come first served bases. A $5 fee is applied to fares paid as cash or credit card to the driver or customer service agent at the coach. Additional fees may be applied such as airport access fees and or other taxes. 4. Fares are subject to change. Not all discounted fares may be available on all schedules. Fares may be higher during some periods and additional restrictions (non-refundable/non-exchangeable dates) may apply during peak travel periods. 5. To qualify for a family/group discount, passengers must be prepaid and travel together at all times. For child discounts, parents and children of the same household must travel on the same itinerary. Ann Arbor seniors must present a Senior Gold Card from Ann Arbor Area Transportation when requested by the driver. 6. Customers are encouraged to book online to obtain the lowest fares. Reservations made by telephone through our office incur a $5 reservation fee. 7. All Michigan Flyer/Airride tickets purchased online or via telephone are completely NON-REFUNDABLE with one exception- see ** below. 8. All passengers should be at the boarding point 10 minutes prior to the scheduled departure time. This allows our drivers to board customers in a timely manner, so as not to delay the departure of the vehicle. Please provide your name to our driver and have access to your order number as a supporting documentation. 9. Cut off time: Passengers who are not at our boarding location 2 minutes prior to departure may lose their seats to standby customers. 10. Parking rates are set by the parking facility owners and are subject to change. Michigan Flyer does not own any parking facilities but does facilitate parking space rental from the city of East Lansing and across the street from the Blake Transit Center. Michigan Flyer/Airride is not liable for passenger’s vehicles or their contents in these lots, where parking is at your own risk. We strongly encourage you not to leave any visible items in your parked vehicle. 11. East Lansing parking fees must be prepaid directly to Michigan Flyer before departure and a prepaid voucher must be placed on the dashboard of your vehicle. If parking fees are not prepaid to Michigan Flyer, your vehicle may be ticketed or subject to higher parking rates. A green ticket must be obtained from the office or the driver in order to exit the parking facility. Michigan Flyer/Airride is not responsible for tickets or parking fees if customers are not parked in the correct facility or on the designated parking level of the facility. Please see our ‘Locations and Parking’ page on our website for detailed parking instructions. 12. Ann Arbor-Blake Transit Parking (corner of 4th and William) is paid directly to the parking garage attendant when exiting the ramp. Michigan Flyer/Airride is not responsible for tickets or parking fees if customers are not parked in the correct facility or on the designated floor of the parking facility. Please see our ‘Locations and Parking’ page on our website for detailed parking instructions. 13. Passengers are allowed two free bags to be stowed and one carry-on. All luggage is restricted to 50 pounds per bag and both carry-on and checked luggage size are limited to the same restrictions as posted by your airline. Excess or overweight luggage is subject to a $15.00 surcharge and can be paid at the time of booking or directly to the driver. Bicycles are only accommodated on a space available basis. Bicycles transported will be considered one piece of checked luggage. Bicycles bound for the airport must be contained in wood, leather, canvas, a bicycle box or other substantial carrying case. Please call the office for verification. Scooters are allowed on our coaches and the maximum weight limit of the lift including the scooter is 650 lbs. 14. Michigan Flyer/Airride will not be responsible for lost or stolen items. Lost or mishandled luggage is covered up to the maximum liability of $250.00. 15. No. As of Sept. 1, 2018, we no longer transport pets. However, we do welcome service animals on board with customers who have disabilities. Service animals may ride in the passenger compartment of the bus at no additional charge. For more information, please see our FAQs and the section on People with Disabilities. 16. Michigan Flyer/AirRide reserves the right to refuse to transport passengers whose behavior, in our sole judgment, may be considered detrimental to our operations in any manner whatsoever. This includes, but is not limited to, appearing to be under the influence of intoxicating liquor or drugs, conduct likely to distract the driver or be objectionable to other passengers or prospective passengers, and behavior that may cause financial harm to Michigan Flyer, LLC. Such persons may be denied permission to board the bus, be subject to having their prior reservations canceled, be removed from the bus by the driver or customer service agent, and/or be reported to law enforcement authorities. In any such event, Michigan Flyer/AirRide shall not be liable for any refunds. 17. Wifi Signal may not be available on some routes due to factors beyond our control such as signal strength or other technical challenges. No refund or credit will be provided when wifi is unavailable. Any passenger under the age of 12 must be accompanied by a passenger at least 17 years of age or older at all times. Passengers of age 12 through 17 may travel on Michigan Flyer and must pay the adult fare. 1. The passenger’s trip will begin and end on the same schedule (no transfers). 2. The passenger’s trip must be between the hours of 7:00 a.m. and 8:00 p.m.
3. The parent, guardian or legal custodian of the child must complete and sign the Unaccompanied Child Form of Indian Trails (our parent company) authorizing the child to make the trip, and return the form with ID to the driver on duty. This form specifically names the person authorizing the trip and the person meeting the child at the destination station and the telephone number at which this person may be contacted. It also provides an emergency contact name and telephone number in the event it is needed. The Unaccompanied Child Form is available from your driver, or may be downloaded here. 4. In order for the child to be released at the destination, the person named on the Unaccompanied Child Form as the one meeting the child must present positive identification, such as a driver’s license or state-issued identification card, to the driver at the destination stop. Without such identification, the child will be released into the custody of the Child Protective Services or local law enforcement officials in the destination city. If any of the above conditions are not met, then the passenger must be accompanied by a passenger at least 17 years of age or older in order to travel.